Taste test: These are regular chips without much jalepeno kick on them at all. I had to lick several chips before deciding whether there was a mistake and I got something else. If you're looking for a chip with kick, skip these. 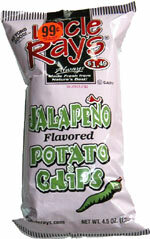 Even the hot burn aftertaste that sometimes comes with jalapeno chips never really arrived. More like a smolder instead of a burn. We didn't even have to put our "hot!" warning signs up when we used these for "Chip of the Day." Smell test: A slight jalapeno smell. Other Jalepeno chips we've smelled have a much stronger aroma than this one did.